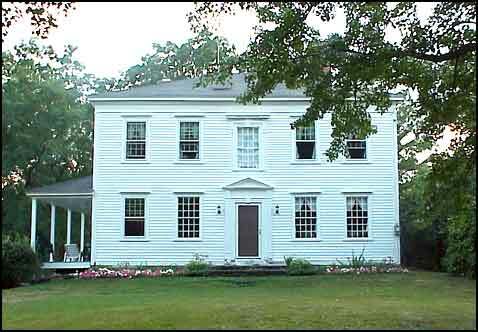 North Mansion was built by William North on Duane Lake during the years 1789-1791. The house, built in the Federal style, is on the National Register of Historic Properties. It has a view to the north of the Normanskill Valley and to the south of the Bozenkill watershed. William North lived there until he retired to New York City in the 1800's where he died in 1833. His son, William Augustus Steuben North, who was a Union College graduate and became a lawyer, continued to live in the house as a gentleman farmer of its nearly 1000 acres. Around 1862 the family sold the house to the McQuaids, who occupied it through the 1940's. The McQuaids sold 600 acres away from the property in the 1920's and a group of developers developed Duane Lake, which currently has about 80 homes surrounding it. The Jocelyn family bought the house in 1947. The house had not been lived in for awhile so they spent about three years taking it apart and putting it back together. The present owner, David Vincent, has lived in the house with his family for 13 years and has restored much of the house to its original style and detail. William North, the original owner and builder, came to Duanesburg in 1787 having married Mary, the eldest daughter of James Duane, the town's founder. North was an officer in the Revolutionary War who served on Washington's staff, and was an aid to Baron Von Steuben, who became a General. Steuben was a friend and became a frequent visitor at the North Mansion. North went on to become Speaker of the State Assembly on three different occasions. In the 1790's North was appointed U.S. Senator and served for about a year then was named Inspector General and Adjutant General in the Army under General Alexander Hamilton. He was also first Chairman of the Schenectady County Legislature when it broke away from Albany County in 1809.